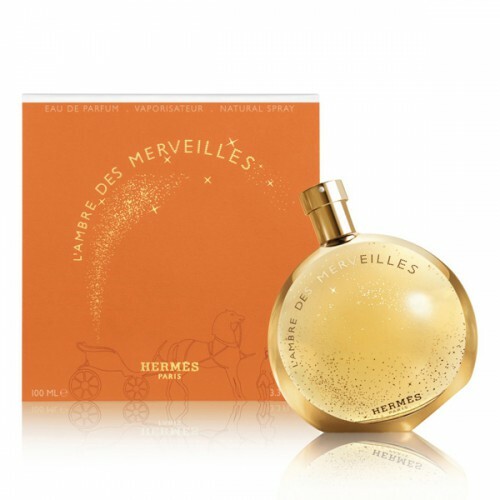 Hermes L'Ambre Des Merveilles is dedicated to the bright & sunny autumn day. Hermes L'Ambre Des Merveilles 100ml. Eau De Parfum is a charming and at the same time very spontaneous ladies fragrance that is specially designed for all modern and dynamic women looking for a new dimension in their lives. The very beginning of Hermes Eau des Merveilles consists of playful violet and captivating cedar wood. The hearts of the aroma penetrate the tones of energizing amber, playful violets and delicate counterparts. The base of the scent is made up of fine notes of aromatic fir, mysterious cedar wood and a charming vetive. Luxury Hermes Perfume for Women can be used for a business meeting as well as evening social events. The unique composition of the Hermes Eau des Merveilles fragrance will take you to the magical world that will become everyday need for you. Let yourself be carried away into your dreams that can become reality! Hermes Lambre Des Merveilles is a sensual oriental perfume, the harmonious composition of which is perfect for both stylish men and charming ladies. His seductive sound will emphasize the passion and extravagance of the person who chooses this fragrance and will allow it to become the center of everyone's attention. Hermes Lambre Des Merveilles sounds softly and snugly, gently enveloping its peaceful passages and allowing you to experience the unique warmth. His enchanting notes will be especially appropriate in cold autumn evenings, they will allow you to warm up and find harmony. In the composition, the key role is played by sensual amber, which makes the image of a man softer, and the appearance of a woman that imparts refinement and sensuality. A special bouquet is given by a delicious vanilla, originally combined with the playfulness of patchouli. The perfume offered is an ideal way to emphasize your flawless taste and make your charm even more disarming and conquering.